If you live in a co-op or condo, you may envy your friends who own townhouses or single family homes because they have roofs on which they can install solar panels. 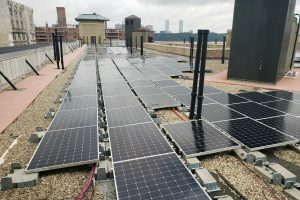 Until recently, most co-op and condo owners had no easy way to directly supply their apartments with solar energy that was generated by solar panels on the roofs of their buildings. However, recent policy changes in New York State have enabled what we call a Solar Co-op. In a Solar Co-op, the power that the solar panels produce can be credited directly to a participating resident’s Con Edison bills. First of all, we’re talking about solar photovoltaics (PV), which directly convert the sun’s energy into electricity. The technology has been around since the 1950’s and some installed systems have been producing sustainable electricity for close to 40 years! There are no moving parts to these systems and the solar panels come with 25-year warranties. It’s a sound investment with minimal upkeep costs. The technology is overwhelmingly popular, with nearly an 800% growth in New York over the last 5 years. It also became the fastest-growing new energy source in the world in 2016. Most co-ops and condos have separate electricity meters for common area and in-unit residential accounts. 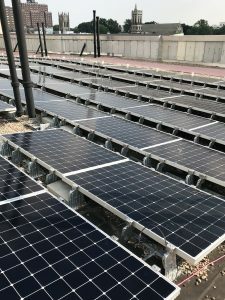 In the past, co-ops and condos could usually only use the electricity generated from the solar PV system to offset the common area consumption. But recent policy changes have enabled what we call a Solar Co-op. In a Solar Co-op, the power that the system produces can be credited to both common area and individual residential meters, allowing each participating resident to reap attractive financial benefits directly on their Con Edison bills. So what exactly is the direct value to you, an owner or shareholder of the building that has solar PV on the roof? Since residential electricity rates are higher, a Solar Co-op can increase the savings that a system will generate by 30%-40% compared to traditional common area projects. When combining the right incentives, tax credits, and annual system savings the average payback period for installing a system is 3 – 7 years. So creating and joining a Solar Co-op is a smart financial investment, but, more importantly, it is a smart investment for the planet. What better way to demonstrate your values and concern for future generations than with a Solar Co-op? Oh yeah, and about those friends who moved to the suburbs – many of them probably found out that they had too many trees casting shadows on their roofs for solar panels to make sense, so you can make them a little jealous, too. Is My Building a Good Fit? The first question our clients ask us is, “how do I know if my building is a good fit for solar?” A good starting point is to find out the size of your roof and any surrounding obstructions. Do you have more than 2,000 square feet of available roof space? Is your building the same height or taller than adjacent buildings? Does your roof receive direct sunlight throughout the day? If you answered yes to any of these questions, solar may be a good fit. If you have always wondered about solar for your co-op or condo, now is the time to ask questions and learn more. Our experts are leaders in the industry and can help determine if solar is a good fit for your building. Please get in touch! Part of what enables an attractive financial return on solar PV systems are the various incentives that are available to support the proliferation of this environmentally-friendly technology. Bright Power’s team of experts will work through all the complexities with you to make sure that you get the benefits. We’ve given a brief description of the incentives below, but please note these are periodically reduced in value and then removed from the market.